Wow, what an amazing process and experience it was to have Andreas craft a chef knife for me. The knife is beyond beautiful and Andreas incorporated all the elements I asked for. Having the glowing detail throughout the circuit boards of the handles and stand gives the look of city lights. And the random Damascus blade is stunning, so much detail and razor sharp. The sheath was exactly what I asked for, having the knife and the steel all in one. Lots of big and small details throughout the whole set and I’m truly blown away. 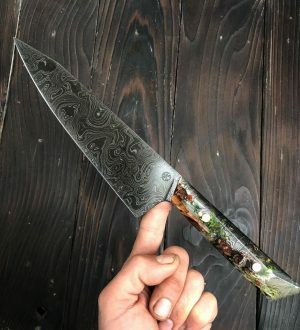 I will definitely have Andreas make more knives for me. Andreas is a very talented blade-smith and a true artist. 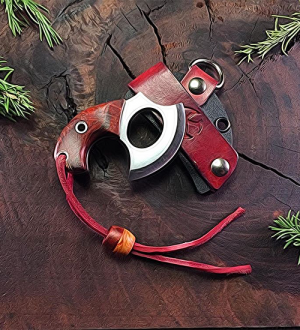 He combines his handcrafted beautiful designs with a gorgeous blade that is well balanced and a pleasure to use. I received one of his Chef knives as a gift and fell in love with it immediately. So when I needed a very special graduation gift for a dear friend who graduated Cornell, Andreas took care of everything and had so much attention to detail that I knew this was going to be a treasured knife. 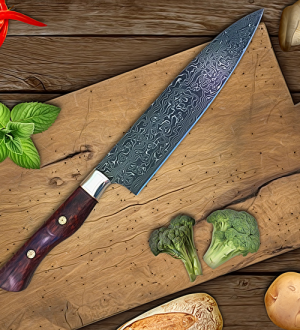 He creates a 13” Chef Knife and 8” Paring Knife in High Carbon Random Damascus with his signature design Natural Galaxy. I wanted all the pieces in the handle to be edible ingredients one would use in a kitchen as my friend is a Chef. Andreas helped me choose organic herbs and spices such as Star Anise, Cumin Seed, Fennel Seed, Red Peppercorn, Cinnamon stick Parsley, Rosemary, Gold Leaves and the Red Gold Saffron. 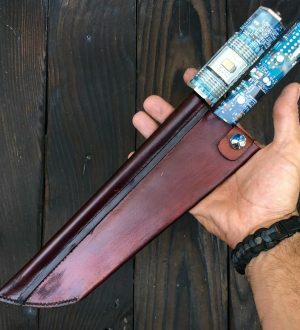 Not only was this absolutely stunning, but then he blew my mind by making a handmade custom leather sheath for the two knives as well as laser engraving it with a special message to my friend. Thank you, Andreas! I will be back for many more! Sharpest knife in my kitchen. Every time I use my RANIA, I can feel the spirit that lives in the blade. Truly a work of art – the most balanced, and no doubt the sharpest knife in my kitchen. Being a butcher of twelve years, I thought it appropriate that on my wedding day it would be great idea to cut the cake with a meat cleaver but one of good enough quality to use for work as well. After doing some research I found Andreas on the Internet and approached him with my idea and he was more than happy to help. 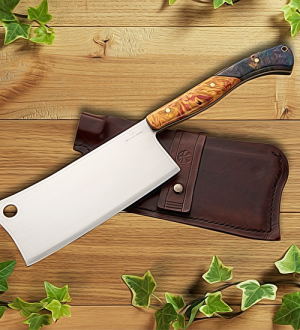 Via email we had good discussions of what style of cleaver I wanted, giving suggestions on the style of blade and the different types of wood that would accomplish the finish I would like for the handle. As for the dyeing of the wood Andreas was more than accommodating, I told him what I was aiming for and if I didn’t like a colour combination he went back and organised another wood colouring until I was happy. 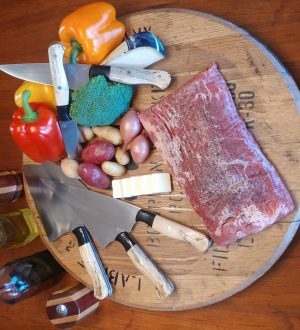 When I received the the cleaver the end product better than I could of imagined, the handle was comfortable to grip and the balance of the cleaver was perfect. The sharpness of it was exactly right for a cleaver, which for me was a true sign of craftsmanship knowledge, because if a cleaver is too sharp the edge is to brittle and is prone to chipping when used. I cannot recommend AK custom Knives enough to anyone who is looking for a knife that will surely be the pride and centre piece of any professionals collection, I will most certainly be using Andreas’s services again. 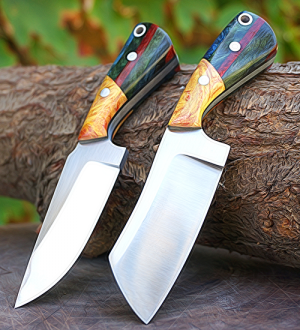 These knifes are handcrafted and made form complete scratch. They have field dressed and skinned 7 white tail, 5 pigs and 1 mule deer. I couldn’t be happier with with these blades the AK Custom Knives made. I would highly recommend these knifes to anyone that does any hunting or outdoor adventures. These knives are legit. Get the job done quick and hold a sharp edge like hell. Totally did the trick down in Texas. Glad we got to try these blades out! The ergonomically designed handle fits comfortably in my hand. The knife that Andreas made for me is by far my favorite knife. 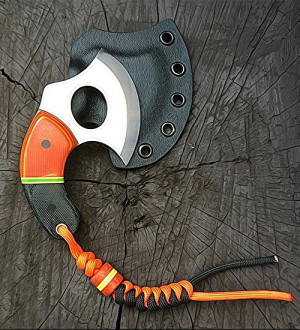 The ergonomically designed handle fits comfortably in my hand and has a very sleek design to it. 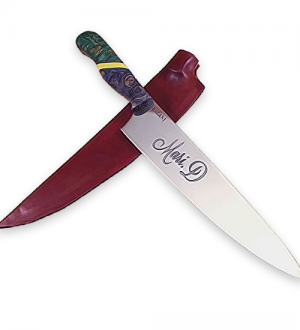 The colors of the handle are inspired by the colors of the Philadelphia Eagles’ uniform, pretty much a perfect match. As a pastry chef, the majority of my knife work is dedicated to delicate applications such as slicing fruit or cutting through cakes and pastries. The knife’s razor sharp blade is perfect for these applications. I’m looking forward to adding more AK knives to my collection. Small In Stature But Packs A Big Punch. The Knives that Andreas sent me are so amazing. So beautiful I can’t believe how well they turned out. They even better in person. They blew my expectations out of the atmosphere. The contrast of the colors and grains of the wood truly works of art. You have out done yourself. The EDC sport are my favorite the best knives I have ever owned. Thank you so much. I could not be happier with my purchase. You are truly a master of your craft. I am so glad I found you on kickstarter. I look forward to being a lifetime satisfied customer and can’t wait to see the mas. Even before I opened up the knife I loved the presentation. It came with an apron, a patch with the AK logo, and some information on the knife that is handwritten. Once I opened the knife I fell in love. This was one of the most beautiful and sharpest knives I ever held. I will most likely only buy knives from Andreas from now on. This knife was a gift to my girlfriend’s dad who is an avid fisherman and often cooks. He loved this knife and he said it’s so beautiful he might not even use it. I have only purchased the”normal” Chefs Knives my entire career and we all know the names. I just happened to find Mr. Kalani somehow, probably FaceBook and began following him and that instantly drew me to his website. It took months and months of debate before finding my set. I will just say the anticipation of the delivery drove me crazy! When they came, it was like Christmas as a kiddo. I couldn’t believe the focus in detail. The weight & balance, the handles ergonomically thought out and even the packaging. Everything about my purchase was pure artistry and I am happy to say I own an original set of knives that are not mass produced. Just wanting for AK to slip up again on something I can’t pass up, I want them all but have to choose wisely. AK, you’ll see another purchase in the future! Thanks again for creating a true masterpiece of a set. An extremely humble master of his craft. 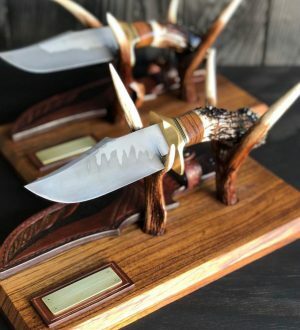 I commissioned Andreas to build a set of knives for my brother and I as a tribute to our late father. What we ended up with are two beautiful knives which will be in our family long after we are gone. This was an idea I had had for a while, and when my youngest daughter and I went shed hunting in March of 2017 we found antlers which made me press forward. With a lot of good fortune, the project landed in the hands of Andreas. He listened to all of my ideas and incorporated them into the project in the most creative of ways. His attention to every detail is both amazing and admirable, I believe he is a master of his work, yet in talking to him you will hear of all the things he is yet to learn. I was able to present my brother with his knife on my fathers birthday just a few weeks ago, the emotion it brought was more than I expected, but exactly what Andreas and I were going for. A truly priceless tribute to the man who gave so much to all he came in touch with. I would recommend Andreas and his work to anyone who considering any form of the project. You are dealing with someone who will go above and beyond and deliver a functional piece of art. 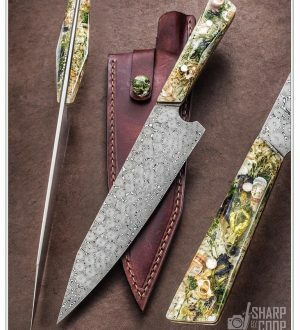 I was introduced to Andreas’ work by my fiancé who would share with me photos of the beautiful craftsmanship of his knife handles, especially in the Natural Galaxy Collection. We had recently taken a trip to Thailand to experience some of his family backgrounds. During our stay, we picked a handful of tiny shells from the beaches of Krabi. Along with the shells, I brought back some beautiful blue dehydrated pea flower but had no idea what to do with these keepsakes. 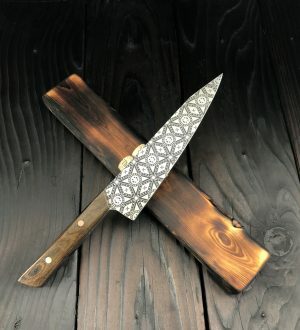 I decided I would incorporate these elements into a knife because what better gift to give a Chef than a knife crafted from an amazing bladesmith. I reached out to Andreas, who was extremely prompt with his response. His excitement and passion was obvious from our first conversation. We discussed some ideas and he gave me some suggestions to consider to truly make this more than a gift but an heirloom. After incorporating a few other memorable items, Andreas drafted up the ideal vision of what I was looking for. He was genuine and extremely thorough throughout the entire process, updating me as the months went by. Upon completion, the knife was shipped out in perfect time for Christmas. I was almost in tears with its beauty and detail, but more with the excitement and anticipation of sharing this treasure and memory with my fiancé. He was speechless of course. 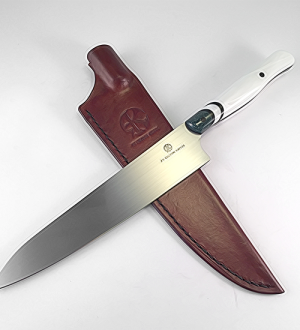 In his words, “the craftsmanship of the knife is phenomenal, well balanced with beautiful blade work. 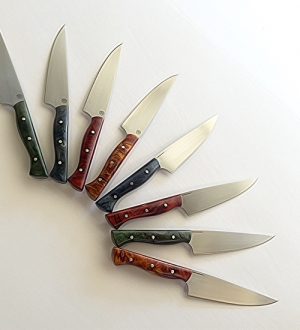 The feel of the knife is both comfortable and natural.” I cannot thank Andreas enough for making an idea come to fruition and memory last forever. A chef knife that fits my style of cooking. I’m a home cook and advocate of healthy eating and making your own meals. I cook almost every day and just like any profession in order to master your craft you need to have a right tools to do it. I have used different type of knives and each had it’s own pros and cons. I wanted a chef knife that fits my style of cooking and had Andreas make me a custom knife. He allowed me to custom choose materials and handle and to every small detail. I find his product with outmost quality as he pays attention to every detail and no specification is overlooked. There is such an ease to use his knives and flows perfectly with my chopping style. I use it every time I’m cooking and can’t wait to add a series of his knives to my collection. I’m truly grateful. I have had the pleasure of doing business with Mr. Kalani several times. I have purchased 11 blades thus far, and have been awe-stricken each time I unwrap one. They are works of art, everyone. They are built well and handle the tasks I ask of them without hesitation or even an inkling of strain. The kitchen knives are balanced and fit the hand perfectly. It is like an extension of my body when I handle one of these knives, almost as if they know what they are supposed to do. The handles are beautifully crafted and colored to suit any desire. I find that it is not a bad idea to just let the artist run with what he feels and let the masterpiece come to life in his skillful hands. The field dressing blades that I have are high carbon and hold an edge like no other knife I’ve used. Truly the Ferrari of blades! 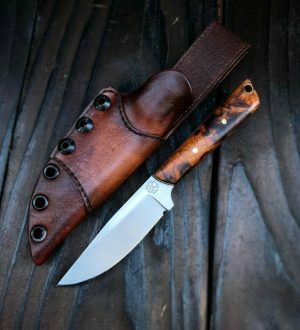 I would recommend AK custom knives to anyone who appreciates the quality craftsmanship as much as the unfaltering performance of their tools. The unparalleled beauty is just icing on the cake. Can’t go wrong with Andreas at the forge. © 2019 Andreas Kalani. Copyright AK CHEF. All Rights Reserved.